Isn’t it a drag that we can’t just eat whatever we want and not put on weight! The problem with food - it tastes too good! 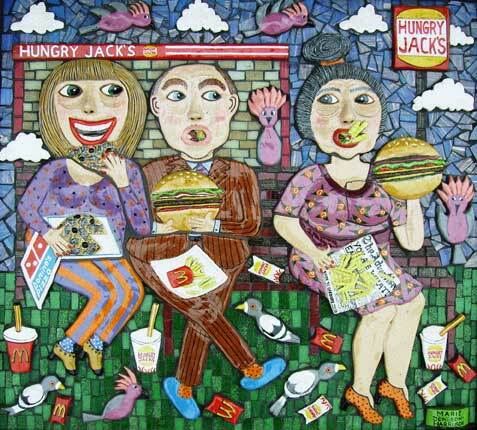 This ceramic and mosaic artwork “Snax attack at Hungry Jack’s” was a delight to make. I do love food, although for the most part I do eat healthy, I too dream about all the naughty foods that I enjoy, hamburgers with the lot (although in my case, without the meat, lol chips, milkshakes and yummy pizza.) I had so much fun sculpting all the food out of the clay and then painting it all, I was constantly hungry the whole time!! So when whilst in the kiln the breast exploded and fell off on this artwork I instead of feeling upset, thought it was just karma and decided it fitted very well with this subject matter. That could happen if you eat too much,lol. The Snax attack artwork sold at The 4th “Festival Mondial d’Art Naif” in Katowice, Poland along with some other artists paintings for the worldwide naive exhibition at the Szub Wilson Gallery during 17th June – 14th August 2011. How nice would it be to wake up to a Buffet every day, you know the one that you get on holidays, a whole room full of food, there is 6 different types of cereals, yogurts in every flavor, low fat, full fat and birch. Then you see a tropical color delight with all the different fruits of the world. Oh I know it all sounds pretty healthy so far – but wait a minute then we go to the fry ups, sausages of every country, and ham and then as you get in some of the Asian countries there is beef ham-what the? Fried eggs, sunny side up, poached, scrambled, boiled or an omelet with whatever you wish thrown in. Never mind all the different breads, white, whole meal, mixed, kibbled, rye, sourdough, lavash, damper, bagels, pita & naan. Then there is all the really Asian food – now I for one absolutely love my stir-fry’s and curries, sushi, laksa and all the rest. However I must draw the line at eating fried fish and miso soup first thing in the morning and what about the porridge? Nothing wrong with porridge I hear you say; that is good old fashioned food. Well perhaps it is just me being a vegetarian that I cannot stomach the combination of breakfast porridge and chicken – that you get in Bali and Malaysia – what’s with that? My stomach is a bit delicate in the morning, but show me all the delicacies and I am all yours if it is later in the day! I have always loved food and at times been totally obsessed with it. Most probably it all stems from my modeling days and the fact that you seemed to be on a constant diet. In a way though later on in life I am glad of that discipline as I have been reliable informed that most people increase their weight by 2 kilograms each year. The funny thing is that just 2 kg is nothing that you would really notice over a 12 month period, but then the next year rolls around and suddenly there is another 2 and that makes 4, right? Most people put these kilos on during the Christmas – New Year period or holiday time. All of us have good intentions to lose the weight but somehow or another suddenly there is the holiday coming up again and here we go again. So it’s no wonder then that so many people become obese over time- 2 innocent little kilos over say a 20 year period suddenly amounts to 40 kilos of fat! Oh what a bugger! Perhaps you need to surround yourself with a few more brazen thieves whilst you have your brekky, so that you can finish the meal of with a hearty run up stairs and all around the hotel lobby to try to catch him. Well that is what we did on a family holiday in Penang recently. My husband is one of these people that “people watch” and that keeps him amused no end and he can always spot when something is not quite right. So there we were enjoying one of these wonderful Buffet breakfasts when hubby pointed out this fellow to me – he was sort of skulking around, but I put that down to that he was looking for his group or family. Then there was the fact that in the very hot Malaysian morning he was wearing long pants and a light cream jacket, well again I said to Bryan some people feel the cold more than others. So it goes without saying that I got a surprise when this fellow made a very swift move and dove like a swan onto the back of the chair of the couple a few tables up and made off with a handbag, quick as a flash and he was gone up the stairs into the lobby. Of course hubby saw the whole thing and both he and I and the kids ran after him but to no avail – as far as we could understand he must have had an accomplice with a car waiting to scurry him away. The lady tourist in question wasn’t too bothered, the thief had made off with some change, a comb and a lipstick but what did irk her were the scripts for some heart medication, so I think he would have been rather a disappointed thief that day, looking at the loot he ran so fast for,lol.